This is a follow-up post from the earlier listing of 80 ways to lose money. 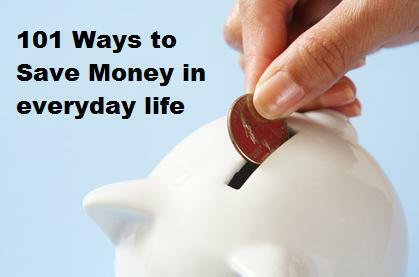 Now in this post I am going to mention 101 ways to save money . These are some coolest and easy to implement ideas that any one can carry out. Saving money is one of the essential steps of managing personal finance. you gradually go from bad financial stage to a neutral stage by adopting various money-saving ways. Then start earning more money, getting a raise, having a side hustle, etc. So, start your new financial life with a goal to save money, at least 10% of money this year, compared to previous one. I will mention the ways you can achieve the cost saves. Switch off the fan, air conditioner when you leave a room. With average electricity bill of $100 you can save up to $10 per month by switching AC off alone. During summer months if we are coming back home just before the bed time, we turn AC at 81 degrees, so that by the time we are off to bed, room is cooler to bearing level. Apply various driving techniques to save on gas cost. ou can easily reduce gas consumption by driving slower and avoiding frequent break and accelerator. Whenever I can, I use cruise control which helps a lot on gas mileage. Use fans which rotate when winds blow as you need no electricity for them. Walk as much as you can and use public transport which cost less and save gas. Close the water faucet while brushing. See – Save water, Save money. Close the shower when applying soap or shampoo. Drink lots of cold water to keep your body temperature cool and reduce the need for air conditioning. Use fans instead of air conditioners when it is not too hot. Wash your car or other things on your lawn so don’t need to water them again. Water the lawn or the plants before sunrise or after sunset, to keep air cool and prevent wastage of water. Instead of washing clothes according to color, separately wash the clothes that lose color and wash the rest together. Don’t overeat and be healthy. Buy a bigger freezer to store bulk items for extended period. Don’t keep food in refrigerator for too long, it spoils the food after a few days. Use steel or stainless steel as it lasts longer than plastic articles. Do not hire people for housework, instead do it yourself as it also helps as a good exercise. Leak-proof your home to save on energy consumption. Don’t throw the plastic containers, reuse and re-purpose them. Choose a bank with no-fee/lesser-fee to bank with. Instead of ordering a pizza, buy frozen pizza which costs less. While washing clothes turn them inside out to preserve their appearance. Use less detergent powder unless clothes are very dirty to make them last longer. Use old clothes to make rags, etc. Instead of expensive cleaners use vinegar. Don’t get attracted towards sales. Instead of gas/oil mowers use a push mower. Wash clothes only when they are dirty. Pay all bills on time to prevent penalty fees and finance charges. Always check your bank balance before writing a check, to avoid overdraft fee. Practice comparison shopping to drive lower cost whenever possible. Cut your cable subscription and watch T.V online. Before you go for shopping, eat. Make coffee or tea at home. Cut back on eating out frequently. Don’t renew subscription for magazines you hardly read. Quit smoking to save on cigarette cost and future healthcare cost. Buy generic store products instead of name brand. Create your monthly/annual budget and stick to it. Don’t ask for home delivery if it is not free. Drink water instead of soft drinks. Cut on the number of trips to the mall. Reduce auto insurance premium by raising deductibles. Wash your car yourself, do not use car wash.
Use solar water heater to save grid electricity cost. Grow plants and vegetables in your garden. Use curtains to keep your home cooler in summer and warmer in winter. Carry your own food when travelling, at least for initial days. Throw parties in your home, rather than at clubs/restaurants. Make gifts at home rather than buying expensive gifts. Use alternate energy to save grid electricity cost. Always try to negotiate while shopping. I always try to bargain for at least 10% reduction of original price. Save flight ticket cost by booking tickets well in advance. Use free online phone services to make calls. Even Skype can help save a lot of money. Try to buy used car to save on new car premium pricing. Go for vacations mid-week to avail the cheapest tickets for the week. Related – How I saved money during vacation. Try to repair simple faults before they become big and require more money to fix. Never full your car’s fuel tank. Don’t buy food if you don’t need it. Park as soon as you see an empty parking space. See – How to save on parking cost. Use rags, instead of expensive paper towels, etc. See – Go paperless to save money. Use things to the maximum. Make baby food at home. Exercise at home, instead of going to the gym. Related – Losing weight saves money. Move in a less expensive city. Buy clothes from thrift stores. Instead of costly zip-lock bags, use simple bags. If possible use less expensive travelling ways. Don’t buy mineral water, use tap water instead. Use free software instead of their paid alternatives. See – How to buy software online. Sell unwanted things to earn extra bucks. Use a simpler cell phone. that can meet basic phone need. See – How to save money on cell phones. Never throw soap remnants, instead combine them and use it. Use cold water in summer to bath and to wash clothes. Instead of an electric clock, use a wind-up clock. Live in a locality with lower home price/rent. Related – How to save money while renting. Before soaping dishes, rinse them. Shop online and save on gas. When not using watches turn them off to save battery. Use a cloth bag instead of buying a plastic bag everywhere. Make pizzas and burgers at home. Reuse old furniture instead of buying new. Do your own taxes with the help of professional software, rather than hiring a consultant. Use a microwave as much as possible to save electricity cost for cooking needs. Do regular maintenance to reduce car repair cost. See – Regular car care for saving money. Wash only when your dishwasher/washing machine is full. Never let your account balance fall below minimum. Don’t buy clothes that require dry-cleaning only. Ask your doctor about generic medicines when available, compared to name brands. Pack your lunch when going to work. If you have an extra room in your house, give it on a rent. Borrow books and movies from local library instead of renting them. While saving money on these thing, do not miss good opportunities to save money and be a motivated saver, make saving a fun. Remember, we grow our wealth One Cent at a Time. Readers, every item in the list can’t be followed by all of you. For some being social drinker is value for money. So I would say practice habits which you are more comfortable with. Great reminder of the many ways we can save money! How about turning this into a wallpaper Infographic so we can pin this? Great idea Paul! Problem is I don’t have infographic software! We’re going to bring snacks for breakfast when we go on our Oregon roadtrip so we don’t have to stop and buy something. It will probably only save us like $12, but that’s $12 we wouldn’t have had if we stopped and bought something! My favorite was that you included an annual budget. So many people have a monthly budget but do not include annual and semi-annual expenses like Xmas, birthdays, insurance etc. I often feel like I am alone in having an annual budget. Thanks for making me realize I am not alone. Wow what a list. I like Paul’s idea. This should be an infographic people can hang on their wall as a daily reminder. My wife and I buy bread, peanut butter and jelly for road trips. We never have to stop at McDonalds then for lunch or anything! We eat and let the kids run around in rest area green areas. It’s perfect. Excellent list with some ideas I hadn’t thought of before. One I didn’t see? Use a cash back credit card ONLY for your gasoline purchases. It’s hard to go on a wild spending binge buying up gasoline, and it’s something that you need anyway. So why not get cash back rewards? Britt, regular cash back cards offer at most 2 – 3% cash back on gas, but, the specialized gas cards offer 4 -6% cash back on gas. Have two cards one for grocery, one for gas. maximize your cash back at both the places. Nice list! If everyone would just incorporate 10 of those, the savings rate would jump. Woweeeee. That’s a lot of great tips, and a lot of which I already do! I need to stop using plastic bags and I need to start using reusable bags though. Raising deductibles is one of my favorites for a few reasons. Higher deductibles means less out of pocket which is good. It also means that you might be inclined to be a little safer (positive behavior) because now in the event of an accident you are on the hook for more. More even driving is also better for fuel consumption so it’s a win-win-win all over the place. Great list! Hadn’t thought about that point. Agree it is basic psychology that when there’s a greater risk we tend to be more cautious. Tips 13, 37 and 42 are simple but powerful. The obesity epidemic is a direct cause of poor diet and exercise habits. This leads to long-term health problems and those are very costly. #17 and #64 made me laugh. #17 because at one point, I did employ a cleaning service, and then I thought, “Why am I paying someone else $125 a month to do something I’m too lazy to do?” And I always abide by the advice in #64 – more for health reasons than for frugality’s sake, though! Thanks for this post, which I found very interesting and timely. I would like to contribute with you pointing a topic with relation to savings. I think the main driver of savings is to find a “good motivation”. In my case, what has worked best is the relationship between savings and investment. That means if I use my savings in some kind of successful investment, then enters into a virtuous circle. More savings becomes more investment and more investment becomes more profits. I am dedicated to financial investments and it keeps me motivated permanently. In my blog I’ve written about this issue and the response from readers has been very positive. Try it!. thanks for the tip, I will do some more reading on the subject for sure. What’s the link to your post? I’ve actually heard/read that drinking cold water actually tricks your body into thinking that it’s cold so will not respond to the genuine heat outside of the body and leave you feeling warm. Apparently it’s better to drink tea which causes your body to perspire and naturally cool itself down. Some nice tips that many people miss. The funny thing is that I do quite a few of the things you’ve mentioned, some of them out of habit however. While some of your tips are definitely new to me and I’ll definitely be implemented them. After all, if it says me money, then it’s worth me investing in it. Saving money is not easy these days… these tips are pretty powerful if you apply them. Thanks for sharing them with us! Thanks for the marvelous posting! I definitely enjoyed reading it. There’s so much money to save! We need to be wise in our sending decision. I want t cut off my credit cards and live only on cash/debit card. Thanks for posting. There is wealth of knowledge here. And you bet, I am saving small changes every day now that I carry my lunch box to work. Saving money is very important so that you can use the saved money for your expenses or at the time of child’s education. Making an investment in Heritage Education Funds can be a good decision for securing child’s future. saving money can be helpful in future financially. Good post, but some of the tips here are not practical. Using discount coupons for shopping can also help in saving money in daily life. Like purchasing groceries from the online store using coupons and promo codes can help you in saving money a lot. You can also use an online software for budgeting, you are likely to find areas where you are spending your money. Use digital coupons while making any purchase from your Smartphone, you will save some money on those. 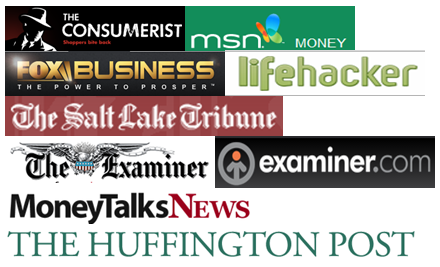 Try to search your favorite magazine online, you may find a cheaper digital option. Awesome Tips to save money. Most of the Tips are working. Absolutely a good search. We think there is a stigma behind the use of coupons and vouchers but the best way to save does involve being able to actually spend less! Hopefully people will get over themselves and learn how to actually save!